10 November 2016, KUCHING: Executive College (EC) held a convocation ceremony for its Diploma in Quantity Surveying students at Level 9 Auditorium, Crown Towers recently. Most of the graduates flew back to Kuching for the ceremony as they are currently pursuing degrees in other universities upon completion of their diploma, while some are working in their field of expertise after graduation. 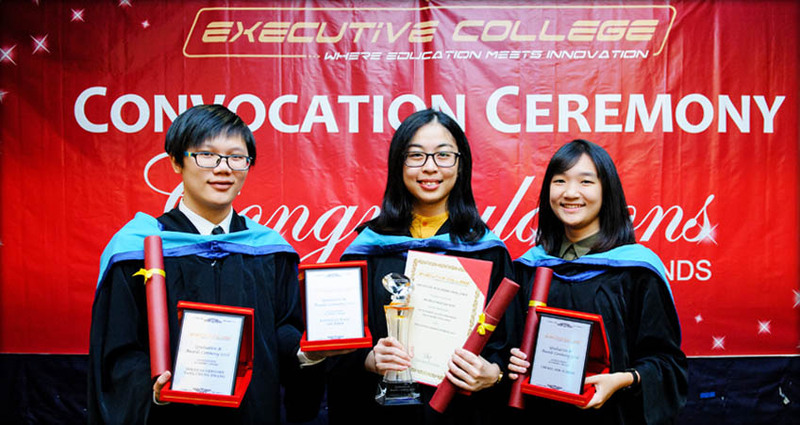 This year marks the 10th graduation ceremony for Executive College. The Outstanding Academic Award was bestowed on Maybelle Wang Sze Kher, Douglas Gregory Tang Chung Hwang and Cheryl Sim Yi Zhen. Maybelle Wang Sze Kher also received The Datuk Robert Lau Hoi Chew Award for Academic Excellence and the Royal Institution of Surveyors Malaysia (RISM) Academic Award. The college’s CEO Sheila Sie encouraged the graduates to continue equipping themselves with knowledge and skills while in the workplace. Sie told the graduates to have a good command of the English language which was important to their careers. Surveyor Jonathan Ngu who is chairman of the Royal Institution of Surveyors Malaysia, Sarawak branch attended the ceremony. The graduates, their parents and relatives were treated to sumptuous refreshments after the ceremony. EC is one of the first few institutions in Sarawak offering a three-year Diploma in Quantity Surveying programme and has achieved professional recognition from the Board of Quantity Surveyors Malaysia (BQSM), Royal Institution of Surveyors Malaysia (RISM) and Malaysian Qualification Agency (MQA). EC offers Foundation in Arts, Bachelor of Business Administration (Hons) and Bachelor of Technology (Hons) in Construction Management. EC provides 100 per cent job and internship with priority given to their own graduates. And when EC graduates apply for internship or jobs with any company under the KTS Group, their application will be given priority. Located on the second floor of Crown Square, 88 Jalan Pending, 93450 Kuching, EC is open from 8am to 5pm Monday to Friday. For information on courses offered and activities in EC, visit www.ecollege.edu.my or call 082-345680.